Two days ago, I posted what I called my final chapter of the mystery of Fanny Wiler. I had finally learned where and when and why Fanny had died after receiving her death certificate from the Carnegie Library in Pittsburgh. But I ended that post with the remaining questions that still lingered. Was the child Bertha born to a Fanny Wieler and Joseph Levi in New York City the daughter of my Fanny? If so, what happened to her? Since I could not find the family on either the 1870 or the 1880 census and since the 1890 does not exist, I didn’t know whether Bertha had died, married, or moved away between 1866 and 1900, and I could not find her in 1900 or afterwards either. But first I had to determine whether this was in fact the child of Fanny Wiler Levy. There was no point in chasing her down if she wasn’t my cousin. I’d already spent far too many hours chasing the wrong Fanny Wiler. 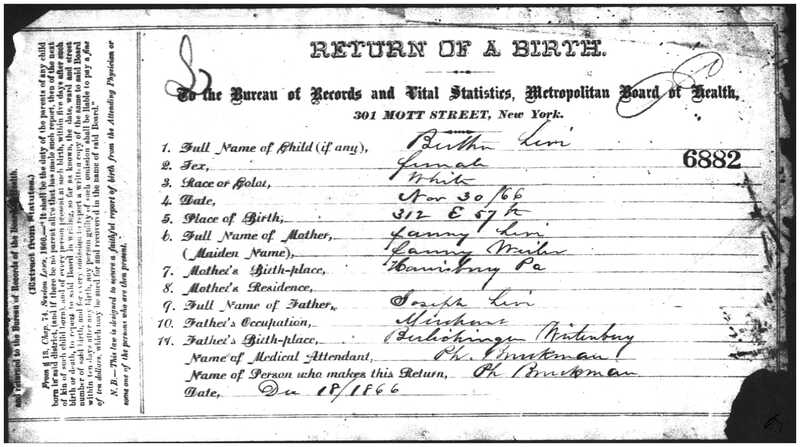 So I ordered the birth certificate for the Bertha Levi born in New York in 1866. It arrived hours after I posted about Fanny. And I was both excited and a bit exasperated to see that Bertha was in fact the daughter of my Fanny. Why exasperated? Because I had no idea what had happened to Bertha. I half-wanted that baby not to have been my cousin so I could finally really put closure on Fanny Wiler. I also feared that that baby had died and would thus just be one more sad story to add to the life of Fanny WIler. But there she was—definitely their child, daughter of Fanny Wieler born in Harrisburg. It had to be the same Fanny and the same Joseph, despite the misspellings and despite the birth in New York, not Philadelphia. 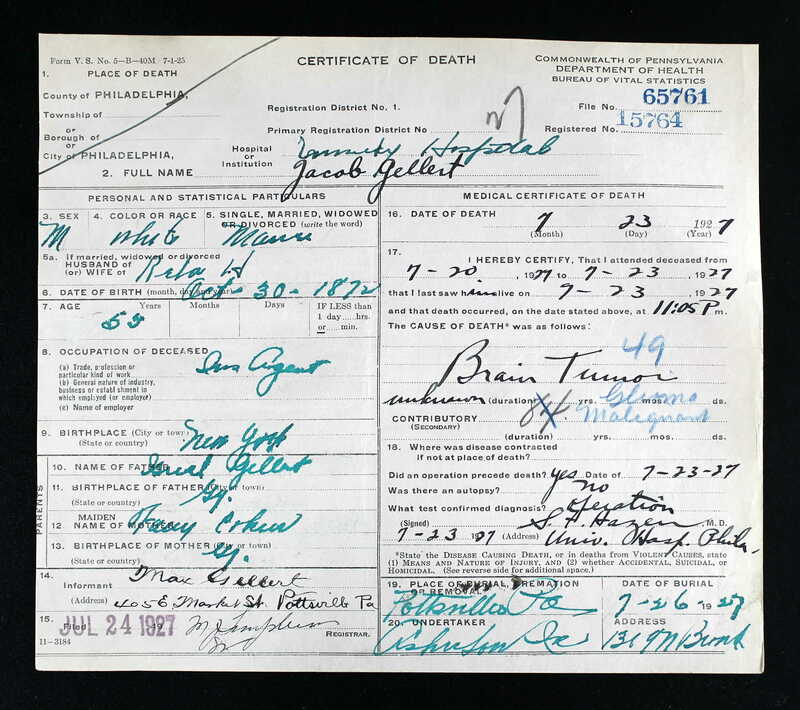 Well, there was no Bertha Gellect, and I decided that the name Gellert was a more likely option, even though it does look more like a “c” than an “r” on the death certificate. 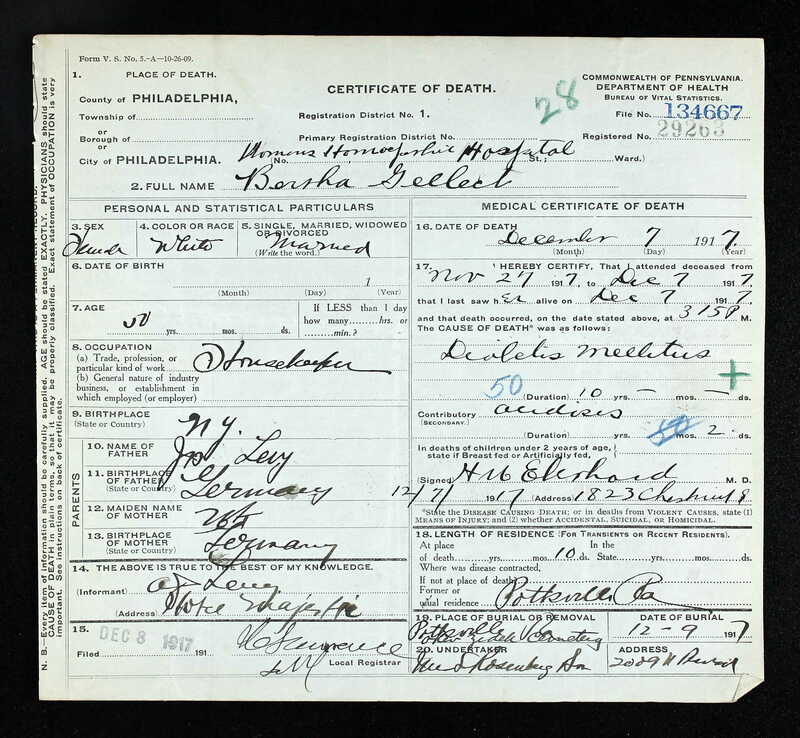 I also knew that in 1917 Bertha Gellert was living in Pottsville, Pennsylvania. Fortunately, my hunch was right, and I soon found Bertha and Jacob Gellert on the 1900 census living in Pottsville. Jacob was a tailor, born in New York, and he and Bertha had been married for three years or in 1897. 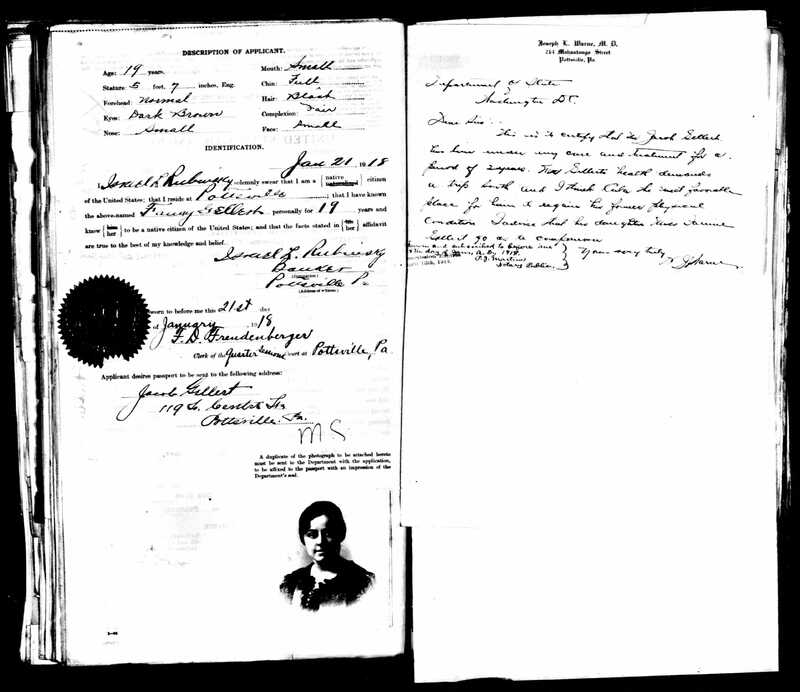 This time the birth places of Bertha’s parents were correct: mother born in Pennsylvania, father in Germany. And the final clue that I had found the correct Bertha? Their two year old daughter was named Fanny. I laughed, smiled, even cried a bit. My poor Fanny Wiler not only had been found; she had a namesake. Her daughter Bertha had named her first born child for her mother. Bertha had only been eleven when her mother died from tuberculosis, and it must have been an awful time for a young girl, watching her mother waste away from this dreadful disease. Bertha had honored her mother by naming her own daughter Fanny. By the 1920 census, however, Jacob and Fanny were back in Pottsville. Jacob was now a widower, and his daughter Fanny was living with him. Jacob had his own business selling fire insurance. The following year, Fanny married Lester Guttman Block. Lester was born in Trenton, New Jersey, in 1895, the son of German immigrants, Daniel and Bertha. (Yes, his mother’s name was the same as that of his wife’s mother.) His father was a clothing merchant. In 1920, Lester was living with his widowed mother and his sister Alice in Trenton, where he worked as a clothing salesman in a retail store. Fanny Gellert and Lester Block had two daughters born in the 1920s. Fanny’s father Jacob died from a brain tumor on July 23, 1927; he was 55 years old. His second wife Reba H. Gellert is named on the death certificate; he had married her by 1922, as they are listed together in the Pottsville directory of that year. Max Gellert of Pottsville, Jacob’s brother, was named as the informant. Notice also that Jacob’s mother’s name is given as Fanny Cohen. Like his daughter, Jacob had married someone whose mother had the same name as his mother. Could Fanny have been named for both of her grandmothers? Probably not since Jacob’s mother Fanny was still alive long after Jacob and Bertha’s daughter Fanny was born, and ordinarily Jews do not name their children for living grandparents. In 1930 Lester and Fanny were living with their daughters as well as Lester’s mother Bertha. One of the daughters had a name starting with B, and since Lester’s mother was still alive, I assume that the daughter was named for Bertha Levy Gellert, Fanny’s mother. Lester was in the real estate and insurance business. 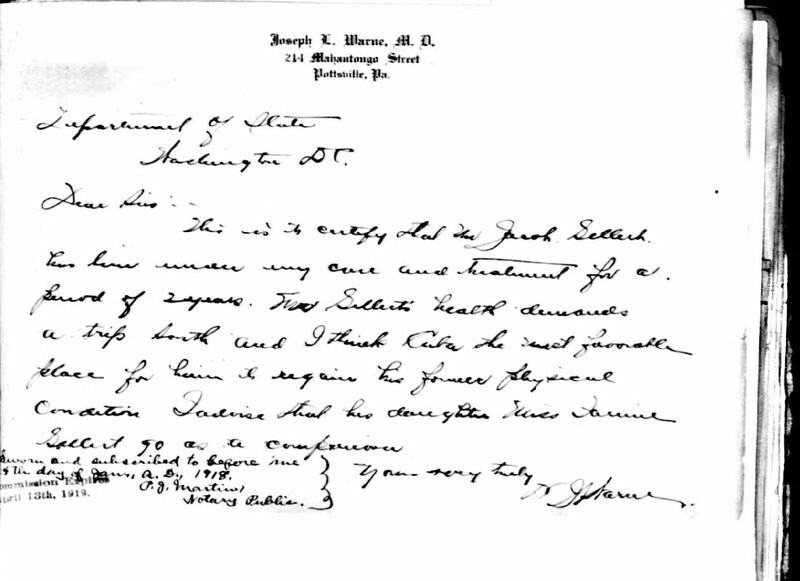 In 1940, the members of the household were the same, and Lester was still an insurance agent, like his father-in-law Jacob. Lester died on December 18, 1953, and is buried at Greenwood Cemetery in Trenton. 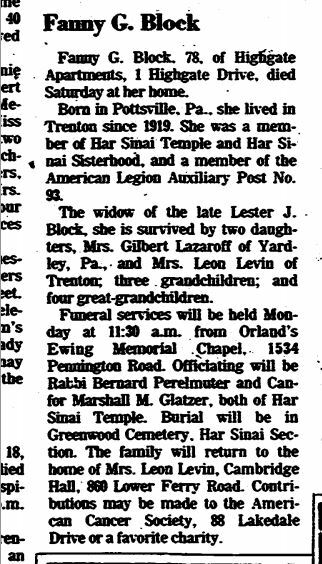 Fanny Gellert Block, the granddaughter of Fanny Wiler Levy,the great-granddaughter of Caroline Dreyfuss Wiler, and my third cousin, twice removed, died on July 9, 1977, when she was 78 years old. She is buried at Greenwood Cemetery with her husband Lester. I am currently trying to contact the descendants of Fanny and Lester. I am hoping that they also will find meaning in the lives of our mutual ancestors and cousins. This entry was posted in Dreyfuss, Pennsylvania, Philadelphia and tagged Dreyfuss, New Jersey, Pennsylvania, Pottsville, Trenton, Wiler by Amy. Bookmark the permalink.